There’s nothing like a hearty, warming soup in winter. Enter Japanese ramen! 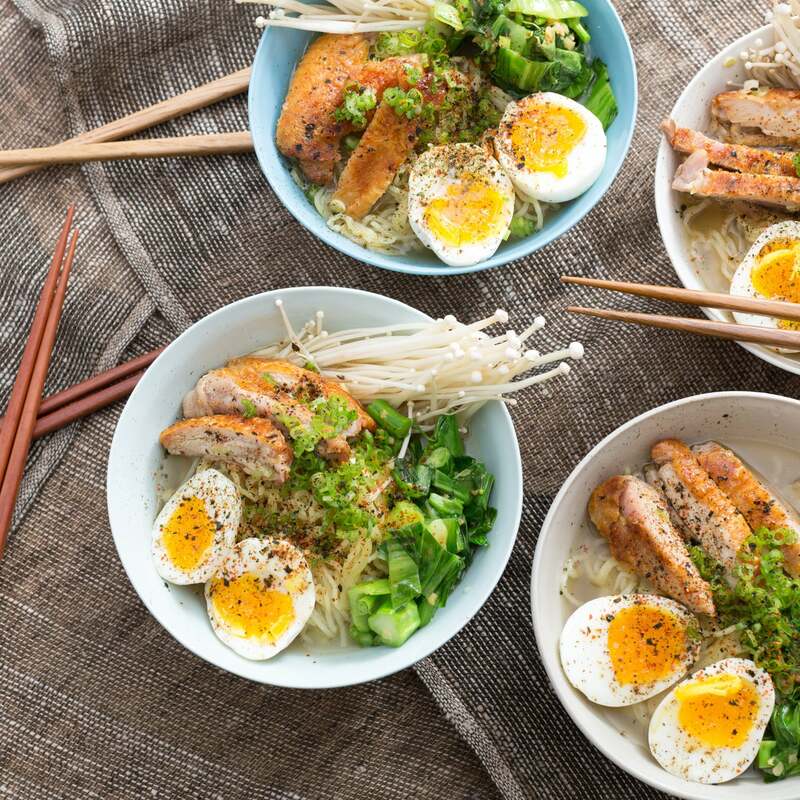 In this delicious dish, we’re featuring fresh ramen from Sun Noodle, America’s premier noodle manufacturer. For thirty years, Sun Noodle has been making the best-tasting noodles available on the market. 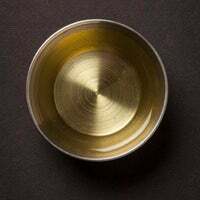 Custom designed just for Blue Apron, the springy strands of heaven you’ll be using here pair perfectly with nutritious choy sum greens, succulent chicken, soft-boiled eggs and a traditional miso-based broth. Wash and dry the fresh produce. Heat a large pot of water to boiling on high. Remove the chicken from the refrigerator to bring to room temperature. Separate the stems and leaves of the choy sum; finely chop the stems and roughly chop the leaves. Cut off and discard the root ends of the enoki mushrooms. Cut off and discard the root ends of the scallions; thinly slice the scallions, separating the white bottoms and green tops. Peel and mince the ginger. 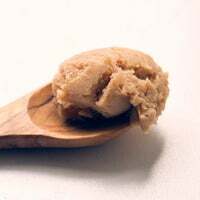 In a small bowl, combine the miso paste, mirin, three-quarters of the soy sauce and ¼ cup of water. Season the chicken thighs with salt and pepper on both sides. 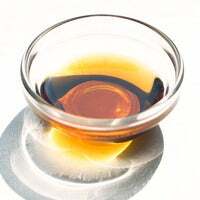 In a medium pan, heat 2 teaspoons of olive oil on medium-high until hot. Add the seasoned chicken, skin side down; loosely cover with foil. 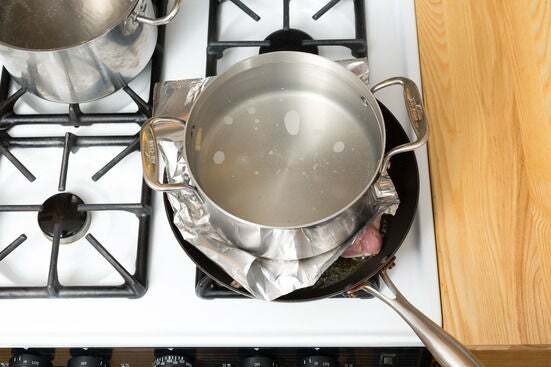 Place a medium, heavy pot on the foil to press the chicken down; fill the pot with water. Cook, occasionally pressing the pot down, 10 to 12 minutes, or until the chicken skin is crispy and browned. Remove the pot. Flip the chicken and cook 3 to 5 minutes, or until cooked through. Transfer to a serving dish, leaving any browned bits (or fond) in the pan. Drain off and discard half the drippings. While the chicken cooks, add the eggs to the pot of boiling water and cook for exactly 6 minutes. 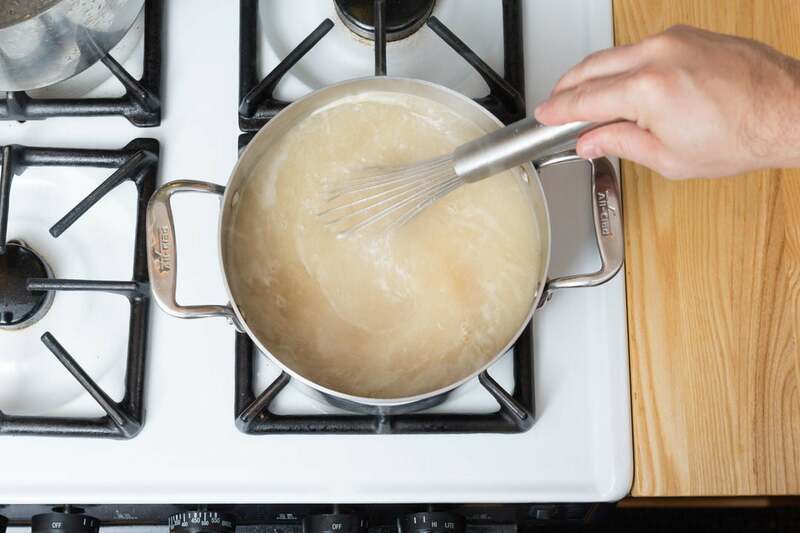 Using a slotted spoon, remove the cooked eggs, leaving the boiling water in the pot; immediately run the eggs under cold water for 20 to 30 seconds to stop the cooking process. 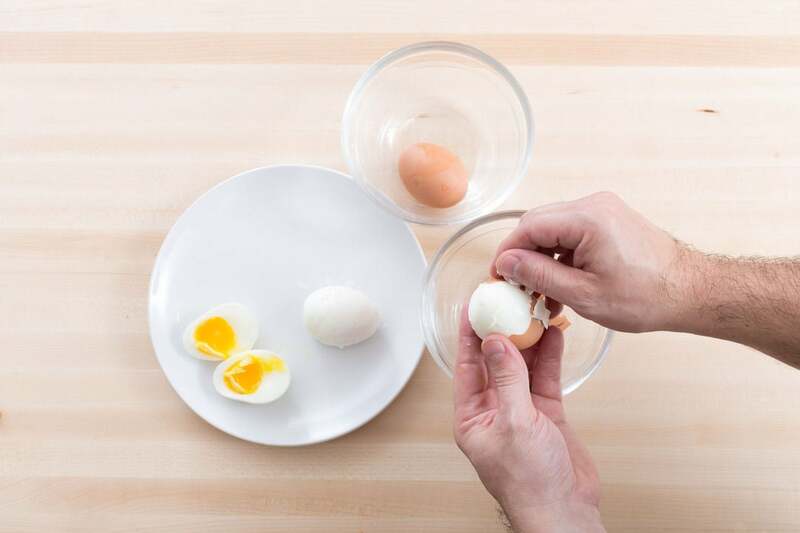 When cool enough to handle, carefully peel the eggs. Cut in half and season with salt and pepper. Set aside. While the chicken and eggs cook, in a medium pot, heat 6 cups of water to boiling on high. Once boiling, reduce the heat to low. Whisk in the chicken demi-glace, miso-mirin-soy sauce mixture and half the ginger until well combined. Remove from heat and set aside. While the eggs finish cooking, heat the pan of reserved chicken fond on medium until hot. Add the remaining ginger; cook, stirring frequently, 20 to 30 seconds, or until fragrant. Add the choy sum leaves and stems; season with salt and pepper. Cook, stirring occasionally, 1 to 2 minutes, or until the leaves have wilted. Remove from heat and set aside. 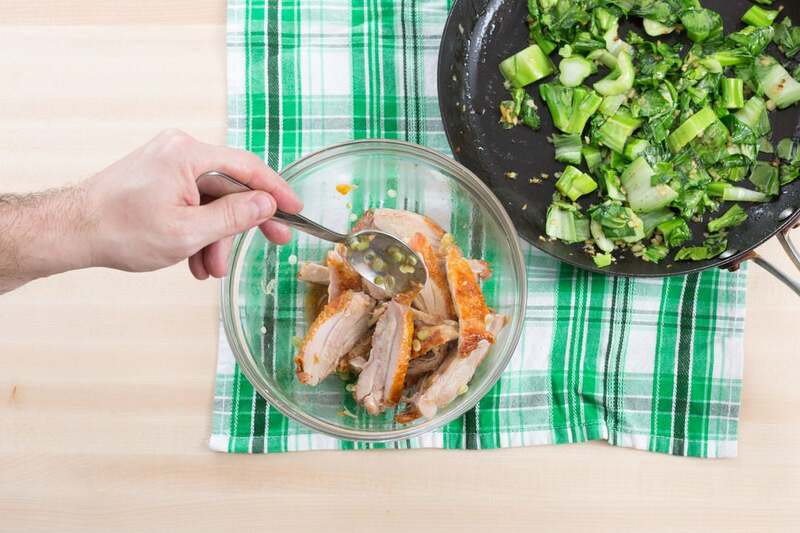 When cool enough to handle, slice the cooked chicken and place in a medium bowl; toss with the white bottoms of the scallions, sesame oil and remaining soy sauce. Add the noodles to the same pot of boiling water used to cook the eggs; stir gently to separate the noodles. Cook for exactly 90 seconds, or just until tender. Drain thoroughly and rinse under warm water. 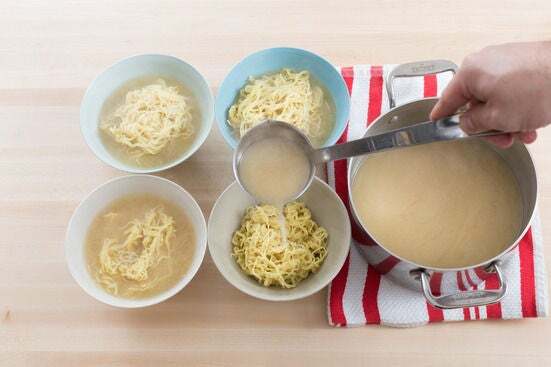 Divide the cooked noodles and miso broth between 4 bowls. 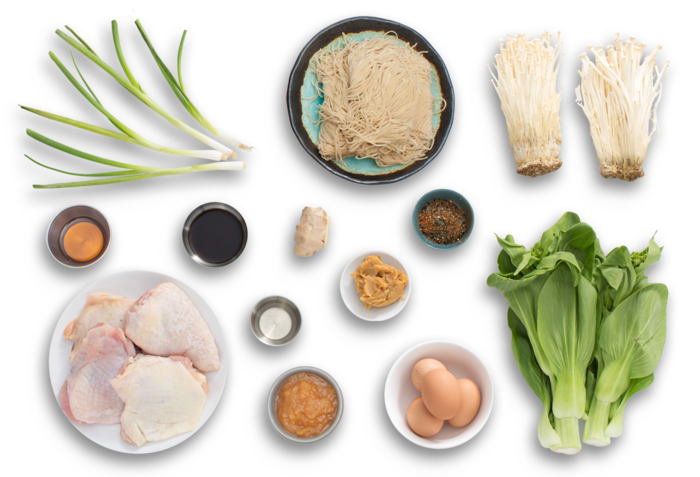 Top with the dressed chicken, seasoned eggs, cooked choy sum and enoki mushrooms. 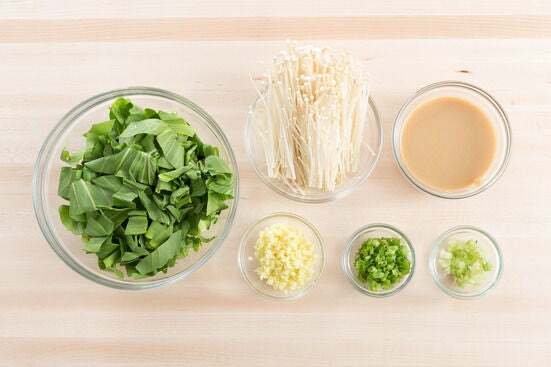 Garnish with the green tops of the scallions and as much of the spice blend as you’d like, depending on how spicy you’d like your dish to be. Enjoy!